I first saw A Matter of Life and Death (1946), aka Stairway to Heaven, when I was a young woman in love. I started to watch it one night when it was broadcast on television and I found it to be mesmerizing. I remember discussing it with the young man that I would marry. It is a love story that literally transcends this world. British Squadron Leader Peter D. Carter (David Niven) finds himself on the 2nd of May 1945 in a situation without a good resolution. The bombed and tattered airplane he is flying is on fire, without working instruments or landing gear, and is going to crash. There are no parachutes left because he has sent all of the other men out with them, except for Bob who has already died. Peter is a poet and quotes from Sir Walter Raleigh’s The Passionate Man’s Pilgrimage, whose verses chronicle a believer’s soul being taken to heaven, where it is forgiven, and awaiting its immortal body. Peter also quotes from Andrew Marvell’s To His Coy Mistress, the passage with “But at my back I always hear Time’s winged chariot hurrying near” because he knows his minutes are numbered and passing quickly. The person with whom Peter is speaking is an American stationed in England named June (Kim Hunter), who is attempting to maintain radio communication with him to help if at all possible. Peter provides June with the critical facts of what has happened to Station Warrenden bomber group AG. He asks June to send a telegram to his mother and two sisters about his love for them. Peter explains he is going to bail out, without a chute, because he would rather jump than fry. Peter becomes concerned he is frightening June and he doesn’t want to do that. He asks if she is pretty and tells her she has a good voice and guts and, if she is around when they find his body, she should look away. Peter presses and tells June he wants to be alone with her. He learns she was born in Boston, Mass., and asks the big question. Peter: Are you in love with anybody? No, no, don’t answer that. June: I could love a man like you, Peter. Peter: I love you, June. You’re Life, and I’m leaving you. And these are just the opening seven minutes of this classic film. Our next setting shifts to monochrome, away from Earth’s three-strip Technicolor, and it is in Heaven where we learn that the alarm bells ring when the records don’t match; then, the bells start to ring. When Peter wakes up he is in water, on the beach, and surveys what he thinks must be Heaven. He is delighted to see a dog but then puzzled by a “Keep Out” sign. He then sees a woman bicycling and speaks with her, immediately knowing that she is June and he is alive and they have fallen in love. The error of not collecting Peter at his appointed time was made by Conductor 71, charmingly portrayed by Marius Goring (who starred with Moira Shearer in The Red Shoes, beautifully written about at the Café by ClassicBecky). He is sent to bring Peter in now but Peter refuses to go with him. June takes Peter to meet Dr. Frank Reeves (Roger Livesey), who sincerely wants to help Peter and encourages him to fight. And that is what the movie becomes, as this matter of Peter’s life and death is argued before a celestial court. This film was lovingly made by the Archers, Sir Michael Powell and Emeric Pressburger, just after the end of WWII. 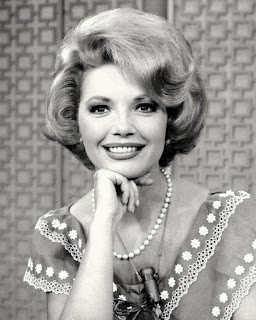 Jack Cardiff provided the spectacular cinematography. 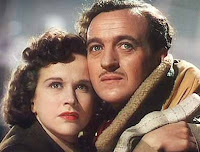 David Niven and Kim Hunter have remarkable chemistry and are provided excellent support by Roger Livesey, who had appeared in two other Archers’ films The Life and Death of Colonel Blimp and I Know Where I’m Going. Another of my favorite films is their atmospheric Black Narcissus, which features cinematography, courtesy of Jack Cardiff again, that is arguably among the most brilliant lensing ever done. That film's unforgettable performance is provided by Kathleen Byron, who has a small role in A Matter of Life and Death. 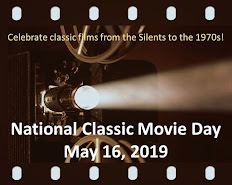 In rewatching this film with my husband, it was pleasant to recall my first viewing. Though three decades have moved along, we are still very much in love. Toto, this is a lovely review of a deeply romantic film. In his autobiography, Michael Powell said that A MATTER OF LIFE AND DEATH was made after World War II to promote the relationship between the U.S. and Great Britain. That theme certainly comes through during Peter's heavenly trial. But, as you so wonderfully describe, I think this film is foremost about a love that "transcends this world". And you're right, the use of Technicolor and monochrome is brilliant (though there seem to be some videos in release with some of the color scenes in B&W). This was a perfect choice for this month's "Love Stories" and I thoroughy enjoyed your write-up. Great review Toto. I love this film. I think David Niven and Marius Goring are spot on in this. You're right about this being a deeply romantic film. Rick and Toto, I think you will be pleased to know that there is a new set of Michael Powell films out on DVD. Each set has a introduction by Martin Scorsese .The Matter of Life and Death is complete and restored. The American version Stairway To Heaven is a edited version. This is the one you want. This set also has Powell's last film Age Of Consent , With James Mason ,and a very young Helen Mirren in the directors cut. I found mine at Costco for $13.99 I was a happy camper. Toto, I have not seen this film, but..your review makes it sounds magical. Smashing write-up of a wonderful movie. P&P were masters of their craft, and I believe that this is one of their best. My favorite, however, is one of yours, too: BLACK NARCISSUS. Kathleen Byron is indeed unforgettable! Just out of curiosity, toto, which title do you prefer: the original or the Americanized one? Thank you all for taking the time to comment! Rick, I enjoyed reading about Michael Powell's statement about promoting the relationship between the U.S. and Great Britain. I know what you mean about some of the video tape copies. The one I own starts in Technicolor, then becomes monochrome and stays there. So, I was delighted to read Paul's comment about the restored DVD available at Costco. Thank you, Paul, for sharing this information with all of us! Kim and Eve, I am delighted you have both seen and enjoyed this classic. It is indeed captivating and very romantic. Some days it just feels great to settle back and watch a lovely romance! Dawn, I hope you are able to see this one day. I am an avid fan of Powell and Pressburger. They truly were a remarkable team. Sark, I love "Black Narcissus." It is so well done and the transformation of Kathleen Byron's character is phenomenal. While I don't hate the American title of "Stairway to Heaven" I prefer to go with what the auteurs have designated. 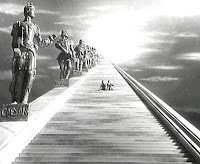 Because while the Stairway appears to be the vehicle by which one accesses Heaven in this film, the more important thing is the conflict which is reflected masterfully in "A Matter of Life and Death." So, if it ain't broke, why attempt to fix it?